I've never actually paid for a professional manicure or pedicure! That may be shocking to some but I just don't see the point when I can easily do it myself at home and for free. These are the products I'm using at the moment to keep my feet and nails looking nice. Even though it's winter I still like to keep my feet nice and soft as well as my nails painted, even if they are in tights everyday. I start off with a foot soak using Margaret Dabbs Hydrating Foot Soak which has a really nice citrus scent that's really refreshing. For this I just use my bath and run enough water to cover my feet. 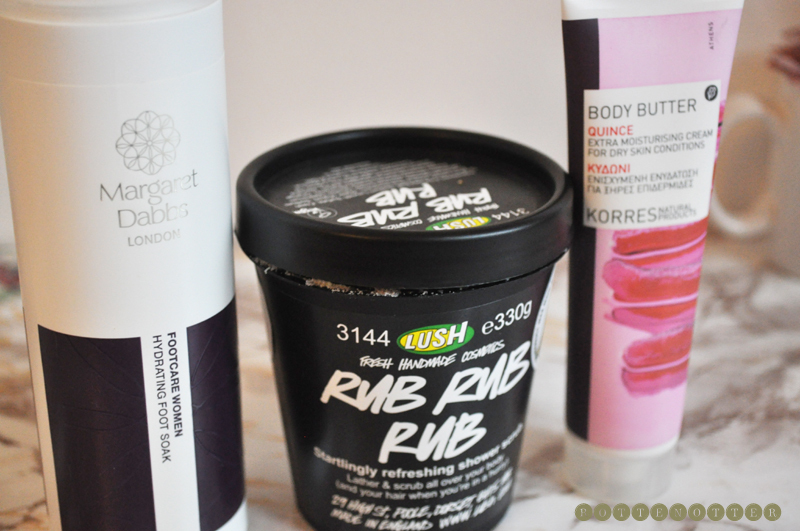 Once my feet have been soaking for 5 or 10 minutes I'll scrub them using Lush's Rub Rub Rub which is one of my favourite body scrubs. 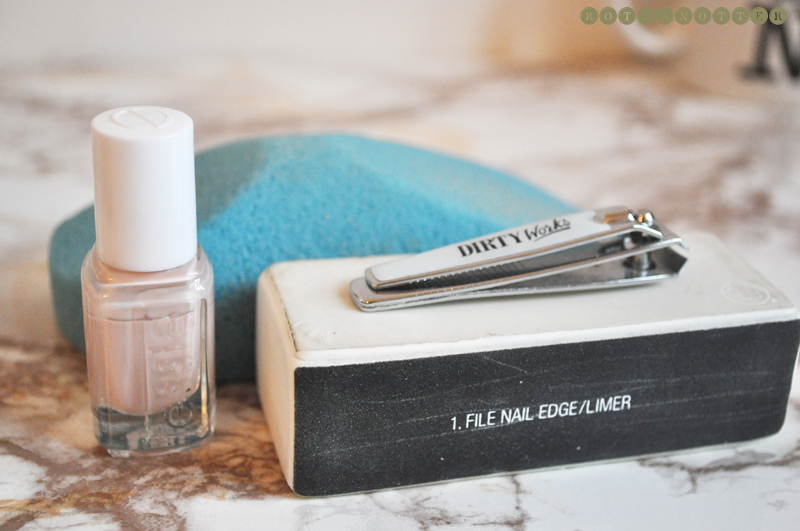 My heels are always really dry so I use a pumice stone to get rid of the dead skin there. The one I have is from The Body Shop but I'm in need of a new one. Once me feet are dry I'll apply a layer of moisturiser. The one I'm currently using and loving is the quince body butter from Korres which smells amazing and works really well. It's actually only the second product I've tried from Korres! The first being the rose lip butter. If my nails need clipping then I'll do them but I always buff them so they're shiny and it makes nail polish last longer. Mines from The Body Shop and I probably need a new one too. Finally I'll apply nail polish and the one I'm currently using, and trying to finish, is Essie's Nice is Nice. A really pretty neutral that looks perfect on the nails. If only the formula was better then I'd love it. Do you ever give yourself an at home pedicure? What products do you use?